Looking for a painting of a very specific size and color? Need help incorporating the right art into your space? We will find the appropriate solution. Artspace Warehouse offers artwork delivery, placement and professional installation. Free art advisory services. 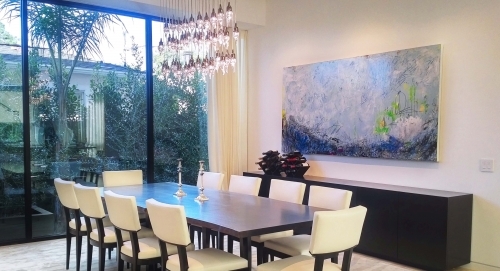 Our expert art consultants are happy to help you find artworks perfect for your space. 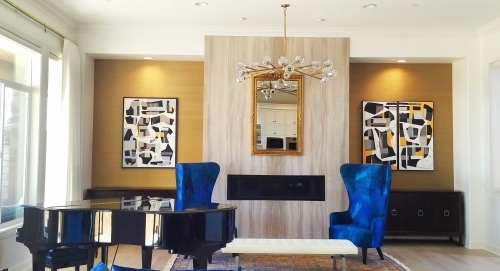 Our carefully curated art selection will enhance your unique environment and add a new experience to your home, corporate or resort surroundings. 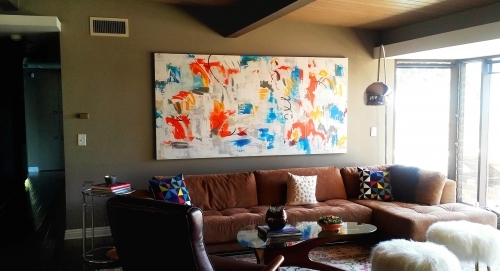 Artspace Warehouse offers to bring a selection of artworks to your home or office in the Los Angeles area to determine which artworks look best in your surroundings. Please send us photos of your walls and surroundings to info@artspacewarehouse.com and we will email you creative artwork and layout suggestions to match your goals and budgetary parameters. We will then set up an in-home or in-office consultation. Artspace Warehouse ships artworks worldwide. Free delivery within Los Angeles County for artwork purchases over $1,000. National and International Shipping and Handling Fees are determined by the size of the artwork. Affordable shipping rates of artworks of all sizes available. Artspace Warehouse ships artworks worldwide. Please inquire about affordable international shipping rates. International orders will receive a shipping quote for pre-approval. International orders will only be processed after the shipping fee is agreed upon. All prices stated on our website are exclusive of sales tax. Sales tax will be added if artworks are sold and shipped within California. Purchasers are responsible for any local customs, duties and local taxes. Our website is frequently updated. The art on our site is generally available at the gallery and for immediate delivery. However we do not guarantee that the art on our site is available. We do our best to provide you the best possible service. The actual artwork colors may not match the exact colors on your screen depending on monitor configuration. We accept all major credit cards, including Visa, MasterCard and American Express. Artworks should arrive in good condition. If the artworks don’t arrive in good condition, please notify us immediately and keep the packaging for carrier inspection. Please provide full name, address, and order number so we can process your claim in an efficient and timely manner. Original artworks are non-returnable unless they do not arrive in good condition. 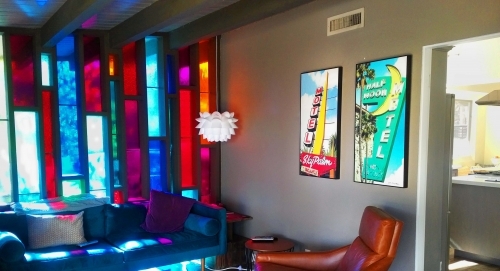 Rent exciting art to enhance your corporate or residential environment. Artspace Warehouse helps organizations of any size to easily and quickly enliven their work or home environment with original art at affordable rates. Inspire your team, impress your clients and reinforce your brand values with fabulous art. 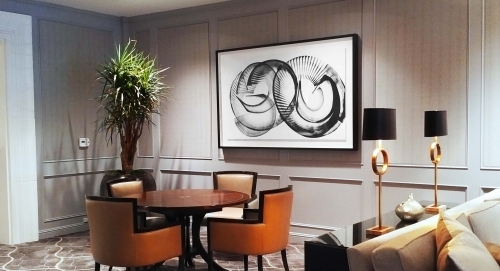 Art can be rented to enhance the appearance of any residential and office environment. Rental art may be a tax deductible business expense. Artspace Warehouse will achieve the finest results enhancing the look of your walls and other areas while reflecting your individual or corporate vision and tastes. Choose from an amazing selection of international and local emerging and established artists for every budget and lifestyle. Free art consultation at your office or home. Free proposal with photos of the artworks and placement suggestions. Optional replacement of rental art every three to six months or annually. 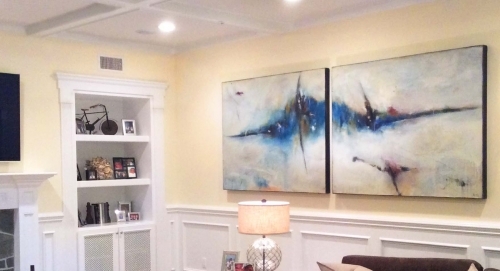 The artwork's value determines the rental fee. The rental fee is billed monthly. 75% of rental fee is applied to the purchase of an artwork rented from Artspace Warehouse. Art delivery and installation is available at an additional fee. The purchase or rental of an artwork does not imply that the buyer owns the license to use the image for commercial purposes. The artist or the estate of the artist maintains the rights to the image unless otherwise agreed upon. Artspace Warehouse specializes in offering a large selection of cleared original art for rent at every budget. Every artwork is cleared for use in Film and Television. All artworks are in stock and ready for same-day pick-up. Convenient parking and truck access through alley. Choose from an amazing selection of international and local emerging and established artists for every budget and set. Artspace Warehouse is the perfect venue for private and corporate parties, birthday celebrations, cocktail receptions, financial seminars, fund-raiser, and company Holiday parties. Artspace Warehouse has over 5,000 sq ft of space and a capacity of 150 people (without seating). Artspace Warehouse is located west of La Brea within a few minutes of the 10 Freeway and just east of The Grove Shopping Center in an attractive retail area filled with galleries, high end home décor stores, restaurants and specialty shops. 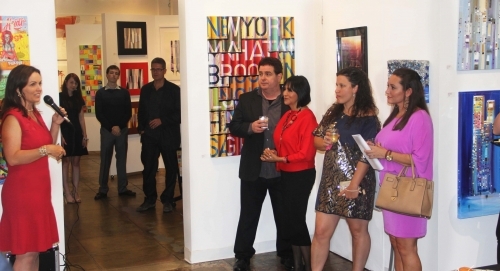 Enjoy your special event inside our gallery surrounded by stunning local and international art. Artspace Warehouse is available for event rental 7 days a week. Since 2010, Artspace Warehouse's high quality artworks have helped design professionals create exclusive interiors within their budgets. Artspace Warehouse is a ASID Industry Partner and a Member of AIA Los Angeles. Please email us the trade account application form to info@artspacewarehouse.com. We will then review your application and will send you a confirmation upon approval. Artspace Warehouse offers special services for Interior Designers who are encouraged to take a selection of artworks to their clients. Our website is frequently updated. The art on our site is generally available at the gallery and for same-day pickup or delivery. The actual artwork colors may not match the exact colors on your screen depending on monitor configuration. Photographs or samples furnished by us are offered as approximations only and we can not guarantee that the artworks will exactly match the color or shade of items depicted on our website or printed materials. Artspace Warehouse serves collectors, businesses and trade professionals all over the world and ships artworks worldwide. International orders will receive a shipping quote for pre-approval prior to processing and shipping. International orders will only be processed after the shipping fee is agreed upon. Please inquire about affordable international shipping rates. All prices stated on our website are exclusive of sales tax. Sales tax of 9.25% will be added if artworks are sold and shipped within California. Purchasers are responsible for any local customs, duties and local taxes required unless otherwise agreed upon. Interior Designers who hold a valid Sales and Use Tax permit and purchase artworks for resale are required to sign separate To the Trade Resale Documents. We accept Trade Account checks and all major credit cards, including Visa, MasterCard and American Express. Unless otherwise agreed, terms of payment are net 30 days. Past due accounts will be charged interest at the rate of 1½ percent per month on the past due balance. The purchase or rental of an artwork does not imply that the buyer owns the license to use the image for commercial purposes unless requested. A copy of the artist release will be supplied upon request. Need an artwork with a special size or color? Customized art is available by select artists. Commission a custom artwork to fulfill your unique vision for your space. Completion time of a custom commission varies by artist and can take a little as one week or up to ten weeks. Share the gift of art and buy a Artspace Warehouse Gift Certificate.